Can a science fiction film be given the horror treatment? This isn’t something new, like The Fourth Kind, but unlike that film, this one is truly terrifying, especially when you least expect it to be. Granted its credits never fail to remind you that the producers here were also behind Paranormal Activity and Insidious, but look hard for that ghoul set to spook, and you’ll never find it. Instead it deals with alien abduction, and boy, has it never been delivered this good, and scary. Written and directed by Scott Stewart, this is a definite improvement from his earlier efforts with Legion and Priest. 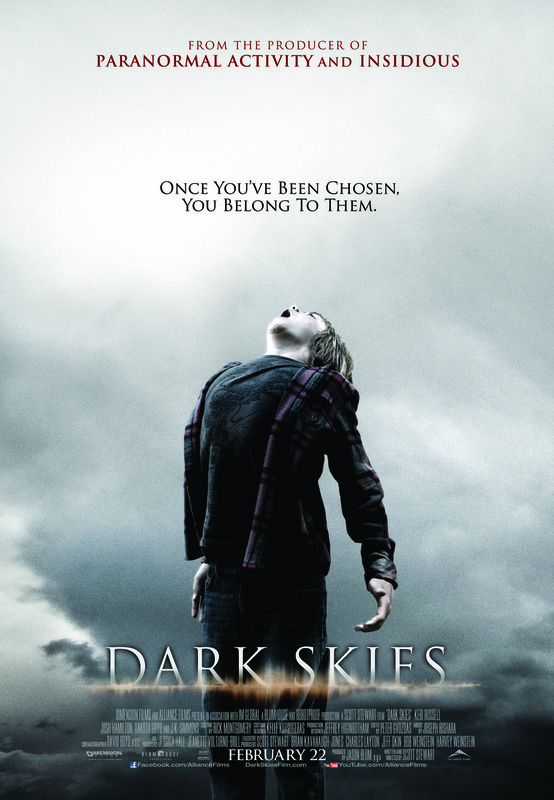 Dark Skies lulls you into some complacency, introducing the audience to the Barrett family, who may seem like the typical all American one living in the suburbs, where dad Daniel (Josh Hamilton) is in between jobs, and mom Lacy (Keri Russell) supports the household for the time being as a realtor to keep the mounting bills at bay. Sons Jesse (Dakota Goyo) and Sam (Kadan Rockett) are the typical teenager and toddler growing up, with a little bit more focus on the former as he hangs out with relative geek company, and is on his first romantic brush with the daughter of his mom’s best friend. Then things start to go all strange, and at times begin to feel like Paranormal Activity in treatment for just a bit. Lacy finds herself inexplicably waking up in the middle of the night to encounter things like having her fridge raided by someone unknown, or seeing her kitchen wares and containers stacked in a geometric pattern. These are the more benign encounters, until flocks of migrating birds start to violently converge at their house, and each family member start to behave as if possessed, losing track of time, and being subconsciously unaware during their awake hours. Worse, they also seem to bear the marks of physical harm, and it’s not long after that CCTV cameras got placed around the house. This entry was posted in Horror, Sci-Fi, Thriller and tagged Dakota Goyo, horror, Josh Hamilton, Keri Russell, Paranormal Activity, Sci-Fi, Scott Stewart, thriller. Bookmark the permalink.